The San Francisco Giants keep finding ways to win and of befuddling the experts in their NLCS matchup with the Philadelphia Phillies. With most experts picking the Phillies to win this series in five or six games no matter what happens it will go seven. 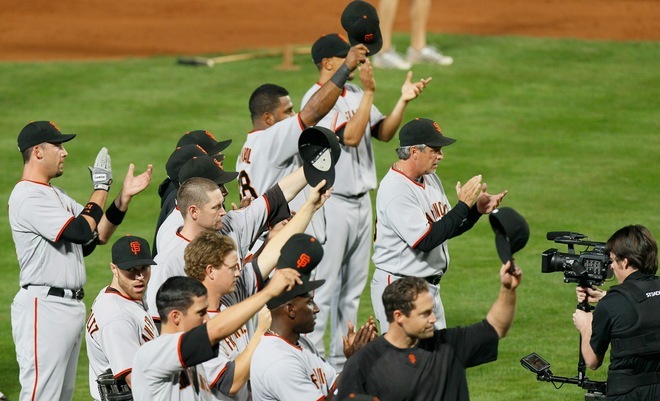 Tonight in front of a wild crowd of Giants fans decked out in orange and black, wearing “fear the beard” beards, panda heads and any number of unusual outfits the Giants defeated the Phillies 6-5 beating Roy Oswalt in the bottom of the 9th to do it. The Giants got the first run on the board in the bottom of the 1st inning when Freddy Sanchez singled and then advanced to second and then third on wild pitches by Phillies starter Joe Blanton. With Sanchez on third base Buster Posey singled to get his first RBI of the night. 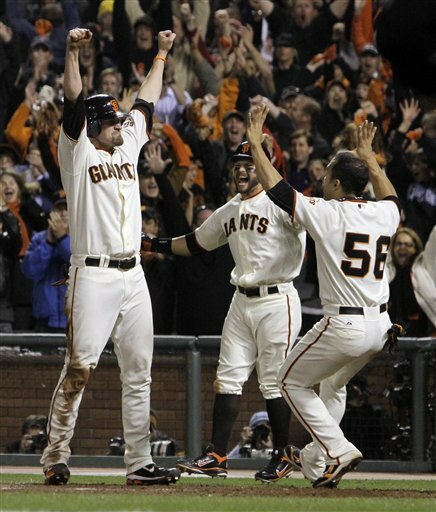 The Giants added to their lead in the bottom of the 3rd inning when with 2 outs Aubrey Huff singled and scored on a deep double by Buster Posey. Madison Bumgarner was solid through four innings striking out 6 Phillies batters and only giving up 2 hits but lost his edge in the 5th inning. The rookie gave up 4 singles one of which by Shane Victorino scored Ben Francisco to put the Phillies on the board but a tremendous throw from center fielder Aaron Rowland cut down Carlos Ruiz at the plate with Posey making a great play to block the plate and hold onto the ball in the collision with Ruiz. This turned out to be a big play which kept the Phillies from a second run on the play and giving the Giants a badly needed out. Chase Utley singled to put runners at first and second and brought Manager Bruce Bochy to the mound to lift Bumgarner in favor of Santiago Casilla. Casilla then gave up a double to Placido Polanco which scored both Victorino and Utley. Casilla then intentionally walked Ryan Howard and hit Jayson Werth with a pitch to load the bases. Casilla then tossed a wild pitch which scored Polanco to give the Phillies a 4-2 lead. Andres Torres walked to lead off the Giants half of the 5th inning and advanced to 2nd base on a ground out by Edgar Renteria. He then scored when Aubrey Huff singled to end the 5th inning with the score the Phillies 4 and the Giants 3. Casilla retired the Phillies in order in the 6th and in the bottom half of the inning the Giants went back to work. Pat Burrell led off with a walk and was followed by Phillies killer Cody Ross who smacked an inside fastball into the left field corner to put runners on second and third. This brought Pablo the “Panda” Sandoval to the plate. 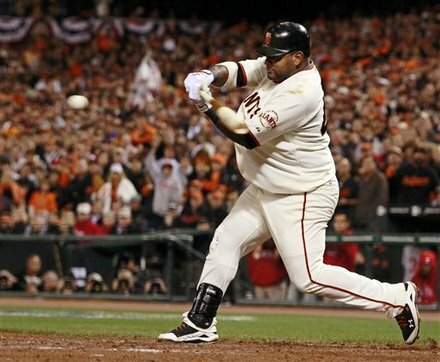 Sandoval who had been benched at the beginning of the series has been in a slump but in this at bat he took a Chad Durbin pitch to deep center for a double which scored both Burrell and Ross and give the Giants a 5-4 lead going into the 7th inning. Javier Lopez came in and put the Phillies down in order in the 7th and the Giants loaded the bases in the bottom of the 7th with one out but Sandoval hit into an inning ending double play. In the top of the 8th inning Lopez gave up a double to Ryan Howard to lead off the inning and was pulled in favor of Sergio Romo one of the Giants’ “black beards.” Romo gave up a double to Jayson Werth to tie the game before retiring Jimmy Rollins on a pop up and Ben Francisco and Carlos Ruiz on consecutive strike outs using just six pitches to do it. 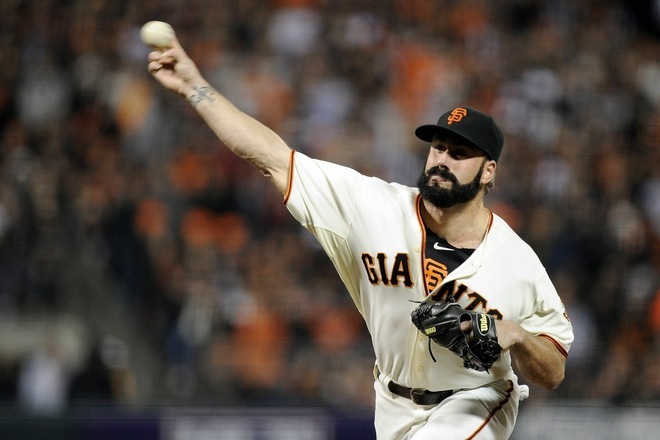 With the score tied in the 9th inning the Giants brought closer Brian Wilson into the game. Wilson who has 4 saves in 6 playoff appearances got pinch hitter Ross Gload on a ground out to shortstop Juan Uribe who made an outstanding effort to get the out. He then struck out Shane Victorino and put Chase Utley out on a line drive to left field. The tension mounted as the Phillies had closer Brad Lidge and starter Roy Oswalt warming up in the bullpen. 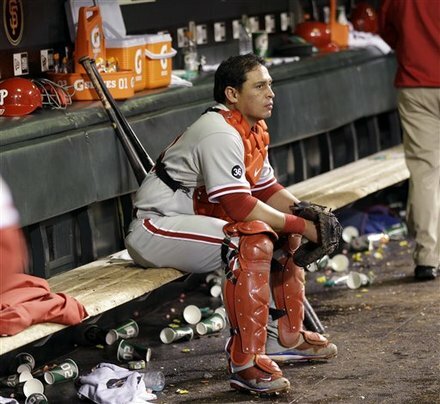 As the Phillies half of the 9th ended it was Oswalt who got the call going on 2 days rest following his start in game two against the Giants. Freddy Sanchez lined out to right for the first out which brought Aubrey Huff to the plate. Huff singled and then advanced to 3rd base on a single by Buster Posey which could have scored Huff had Jayson Werth not made a tremendous defensive play to keep the ball from going to the wall. This brought an unlikely hero to the plate. 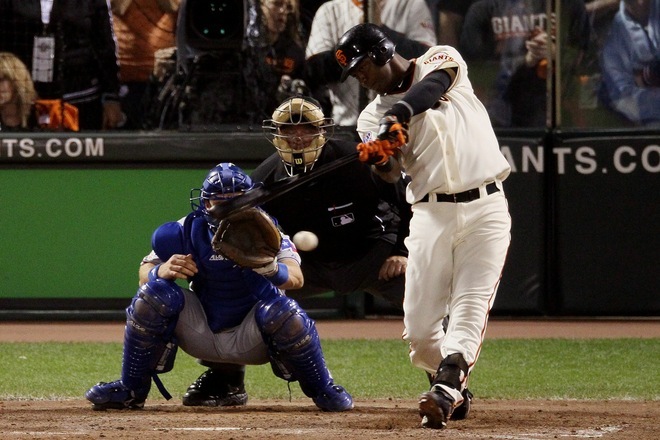 Juan Uribe playing with an injured hand was able to hit a medium depth fly ball to left which scored Huff from third to give the Giants a 6-5 win and a 3-1 lead in the NLCS. The Giants made a great team effort to win this game, the first game since September where they scored more than 4 runs. Timely hitting by Buster Posey who went 4-5 with 2 RBIs, Pablo Sandoval with his 2 RBI double and Aubrey Huff who went 3-5 with an RBI helped push the Giants over the top in this see-saw game. Brian Wilson got the win in relief and Roy Oswalt the loss in a rare relief appearance. The teams meet for game five on Thursday with a battle of the aces on the offing as Roy “Doc” Hallady goes up against Tim Lincecum in what could be the deciding game of the series. Giants fans accustomed to “Tortureball” need to break out their Xanax for this one which could be an epic playoff game with two of the best pitchers in baseball going against each other in a game that could send Halladay and the Phillies home until the spring. 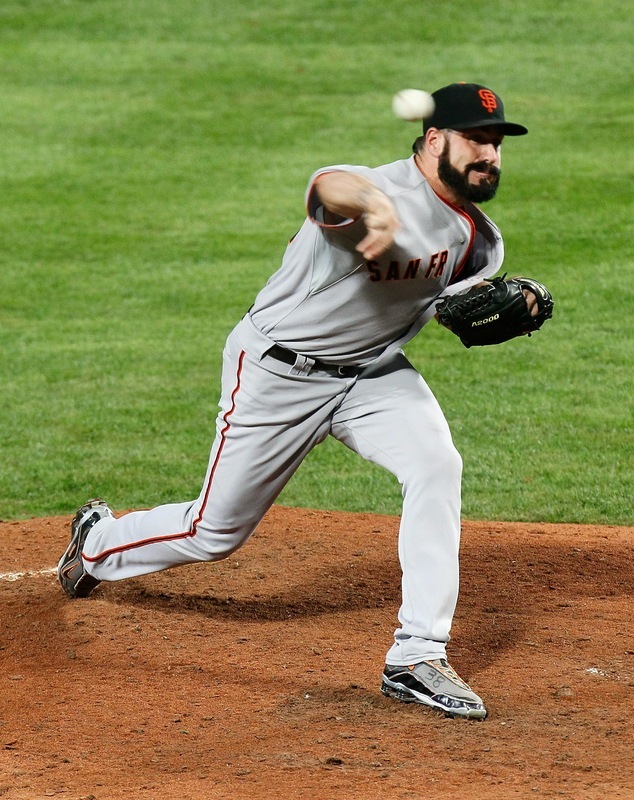 Once again there was a pitcher’s duel between the Atlanta Braves and San Francisco Giants. 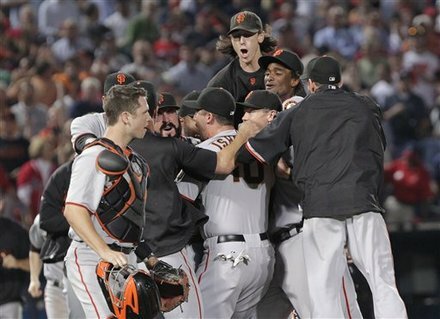 Once again the Giants were the team to come from behind in the late innings to win the game in Atlanta. 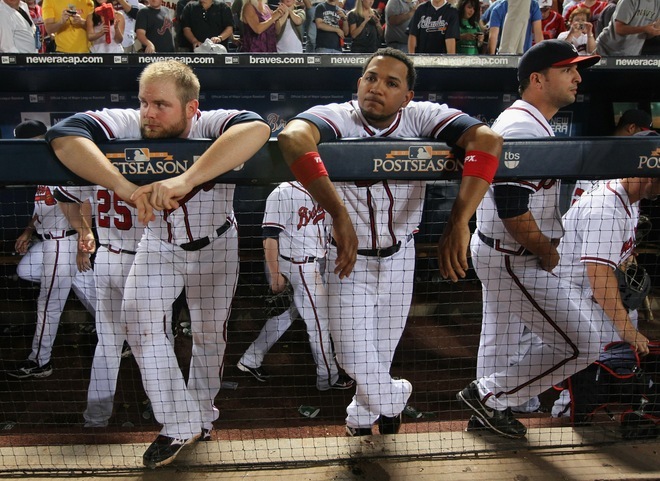 The Braves who have the most come from behind wins in the Majors this year could not come back from a late 3-2 deficit despite getting two walks with one out in the bottom of the 9th inning. Closer Brian Wilson got his command back and got Omar Infante to strike out for the second out and Melky Cabrera to ground out to 3rd base to end the game and the managerial career of the legendary Bobby Cox. In a touching moment Cox came out for a curtain call tip of the hat to the fans receiving a standing ovation not just from the Braves faithful but from the victorious San Francisco Giants. The Giants started rookie Madison Bumgarner in game for against Derek Lowe pitching on short rest. Bumgarner struggled in the first three innings loading the bases in the 2nd and allowing a run on three singles and a sacrifice fly in the bottom of the 3rd inning. Lowe was very effective actually going into the 6th inning with a no hitter which was broken up by a solo shot by Giants outfielder Cody Ross to tie the game. After the first three innings the young left-handed Bumgarner was very effective until the bottom of the 6th when he gave up a solo home run with 1 out to Braves catcher Brian McCann which gave the Braves a 2-1 lead and had the Braves faithful in full tomahawk chop frenzy mode. With the crowd in his face Bumgarner bore down and despite giving up a single the Jayson Heyward struck out Alex Gonzales and Rick Ankiel to end the inning. In the top of the 7th the Giants came back. Freddy Sanchez grounded out to lead off the inning but the tiring Lowe walked Aubrey Huff and then gave up a single to Buster Posey which sent Huff to 2nd base. Bobby Cox came to the mound to pull Lowe from the game with Pete Moylan ready in the bullpen. A defiant Lowe told Cox that he could get the next batter Pat Burrell out and Cox gave way allowing the World Series veteran to stay in the game. Instead of getting Burrell out Lowe walked him to load the bases which brought out Cox for the second time to bring in Moylan. The first batter that Moylan faced was Juan Uribe who hit a sharp ground ball to shortstop Alex Gonzales who threw just high enough to bring second baseman Omar Infante off the bag allowing Huff to score and the bases to remain loaded. Jonny Venters relieved Moylan and struck out pinch hitter Aaron Rowland for the second out. Venters then faced Cody Ross who singled to left to score Posey for the go-ahead run but left fielder Matt Diaz threw out Burrell at the plate aided by a great block of the plate by Brian McCann. The Giants sent Santiago Casilla to relieve Bumgarner in the bottom of the 7th and Casilla sent the Braves down in order. He would get Derek Lee to strike out swinging before giving up a one out single to Brian McCann. Casilla then got Alex Gonzales to hit a soft sinking line drive to shortstop Edgar Renteria who misplayed it but was able to recover and throw out Gonzalez who paused before running to first base thinking that Renteria had the catch. Pinch runner Nate McLouth went to second on the play and Giants manager Bruce Bochy to bring in Javier Lopez and Lopez struck out Jayson Heyward to end the inning. The Giants managed nothing in the 9th despite an Aubrey Huff single. 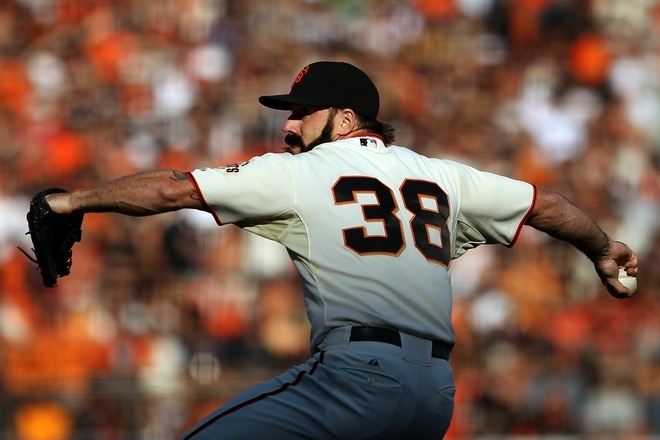 In the bottom of the 9th the Giants brought in closer Brian Wilson. Wilson got pinch hitter Brooks Conrad, the error prone goat of Sunday night to fly out but then walked Rick Ankiel and Erik Hinske. Wilson then struck out Omar Infante who was one of the most effective Braves hitters in the series before retiring Melky Cabrera on a ground ball to third to end the game. This was a true championship caliber series and certainly more competitive and well played than any of the other divisional series game. Like all the games of this series the game could have gone either way. These teams were so evenly matched and played so well that it was a shame that one had to lose. Both secured playoff berths on the last day of the season and both are class organizations and have great fans. 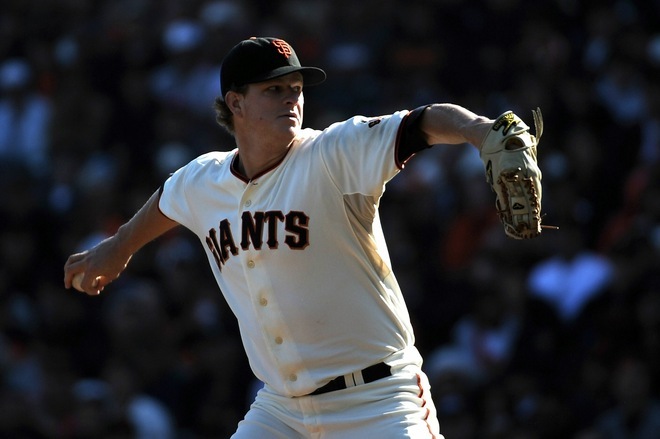 The difference was pitching the Giants starters had an ERA of 0.89 in the four games but not the starters alone as the Giants’ pitching staff allowed just 5 earned runs in 37 innings work for a 1.21 ERA. 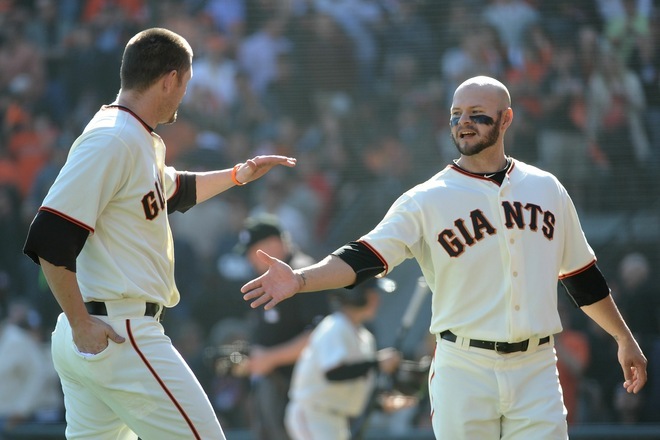 Giants’ starter Madison Bumgarner got the win while Derek Lowe picked up his second loss of the series. 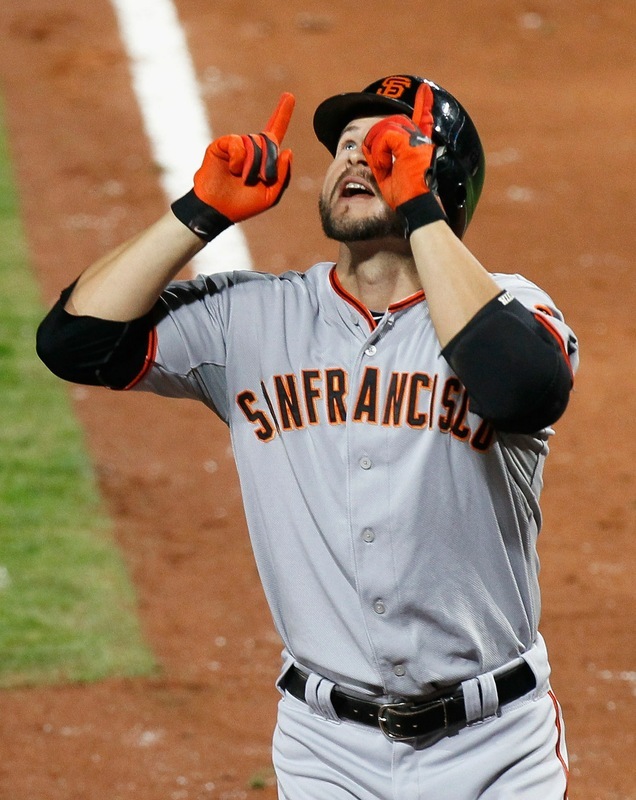 The hero for the Giants was Cody Ross who had the game winning hit in game one and 2 RBIs in the finale to give the Giants just enough juice to end the Braves season and Bobby Cox’s managerial career. 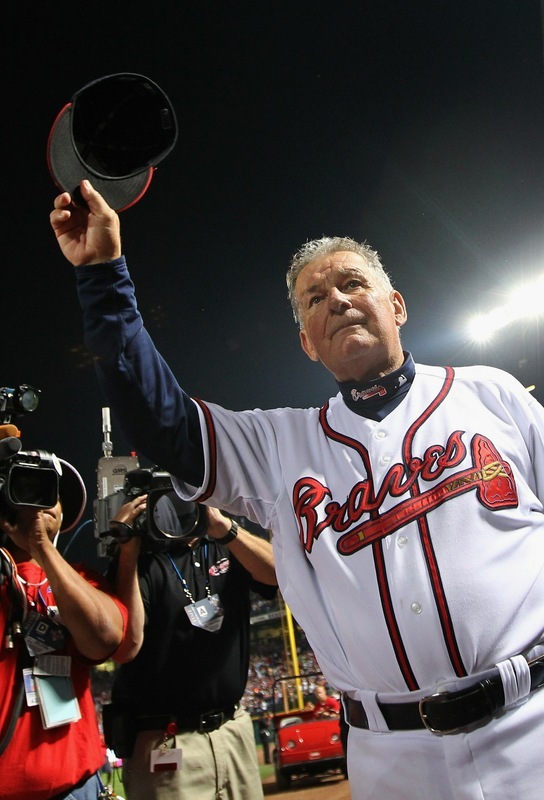 As Bobby Cox tipped his hat at the end of the game I thought back to all of the times that this legendary manager has taken the Braves to the playoffs, especially their amazing run in 2005 with the “Baby Braves” rookies. Cox was an old time manager who knew how to get the most out of his people and even continued to wear steel cleats to his final game. The colorful Cox will be missed and whoever the Braves get to fill his shoes will have to work many years in the shadow of a legend. The Giants now move on the face the Phillies in the NLCS which begins on Friday in Philadelphia. I will analyze that series and the ALCS matchup after the Rays and Rangers series ends tomorrow evening. Chicago White Sox pitcher Mark Buehrle pitched the 18th Perfect Game in the history of Major League baseball on Thursday night at Chicago’s U.S. Cellular Field aka the New Comisky Park, on the Second City’s Southside. This was the second no-hitter of the season and almost the second perfect game. Perfect games are those rare instances in baseball where any true follower of the game, no matter how partisan of fan e or she may be applauds. Since there have only been 18 in a century or half or so of play, these are occasions to really appreciate not only the feat of the pitcher in throwing the perfect game, but also the achievement of the team behind him and the manager in the dugout. A perfect game is one of those rare intersections in life where the stars somehow align and a miracle occurs. Thus they are to be appreciated, more so than about any other event in any sport. This is because of the rare and nearly impossible set of circumstance that has to happen for a perfect game to occur. First the pitcher has to be completely in the zone and in control of the game, no hits, no walks, and no hit batters. Second the defense has to be perfect, no bobbled balls, and no throwing or fielding errors. Third, the opposing team cannot get a break, no grounders with eyes, no bloop singles, no bunts that turn into hits and no close calls at first that might go their way. Lastly the manager has to make the right moves at the right times to ensure the victory. Thus the perfect game may be credited to the pitcher, but it is a team effort. This is something that San Francisco Giants pitcher Jonathan Sanchez pitched a no hitter which should have been a perfect game until Giants Third Baseman Juan Uribe booted a ground ball in the 8th inning allowing a runner on base. Likewise had Giants Center Fielder saved the no-hitter and shutout with one out in the 9th with a leaping catch at the wall. Buehrle himself had found this out in his no-hitter when he gave up a walk to Sammy Sosa. Thursday night Mark Buehrle, who pitched a no-hitter in 2007 pitched a great game and was in total control. Yet he won the game by throwing balls that were put in play and that his defense made the put-outs. Buehrle threw six strike outs which meant the players behind him made 21 put outs. In the field a number of good plays were made and one line drive down the third base line by Pat Burrell landed just inches foul in the 8th. Thus with the White Sox up 5-0 in the 9th manager Ozzie Guillen moved Scott Posednik from Center to Left and replaced him with Wise. Wise is one of the players whose career batting average hovers near the Mendoza line (.214) (see my post at https://padresteve.wordpress.com/2009/07/18/crossing-the-mendoza-line-it%E2%80%99s-not-all-about-the-lifetime-batting-average/ ) who has done a commendable job for the Sox this season following the injury and recovery of Carlos Quentin went into the game for the purpose of shoring up the defense. The Sox were ahead by a comfortable margin, but Guillen knew that history was being made and elected to put Wise in. With one out in the top of the 9th Rays outfielder Gabe Kapler hit a deep drive to Left-center which was actually over the wall. Wise raced from center and not having time to set up at the wall to leap for the catch, simply went full bore into the wall, making the grab of the ball on the run about 18 inches above the wall. As he came down the ball came out of his glove and in the air on the way to crashing to the ground Wise caught the ball a second time, this time with his bare hand to secure the out. It was simply magic, miraculous and whatever word you can say for “Wow.” The look and smile on Buehrle’s face said it all; he knew what Wise had done. When I saw the catch I was reminded of the movie the perfect game, where outfielder Mickey Hart played by Greer Barnes makes a leaping catch to rob a opposing player of a home run and preserve Billy Chapel’s (Kevin Costner) perfect game. Perfect games are rare and while the pitcher’s name is the one that goes into the record book, the game is a team effort. The life lesson for me is that no matter how well I do as an individual that there is always a team out there to help me along. This has never been as apparent to me as since I returned from Iraq. I guess I appreciate the perfect game even more now that I did before I went. These things are a team effort and even if I am perfect for some part of my life, patently extremely unlikely, it is because others, who function as my team mates, manager and coaches do the right things to ensure that nothing gets by them and that they make the right moves to preserve any good work that I do.